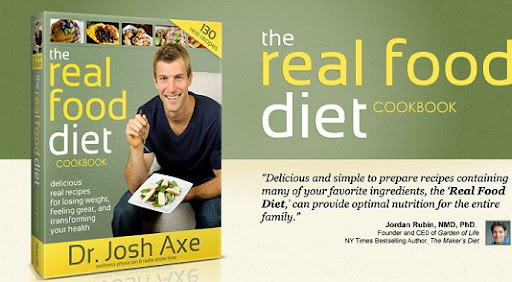 Eating healthy does not mean eating sticks and grass.Eating real natural foods and using proper preparation can make food taste amazing.Dr.Josh Axe's 'The real food diet' cookbook has an umpteen collection of real food recipes that don't just taste great but also help loose weight ,feel great and transform your health for good. I was ecstatic to have received free copies of the cookbook to review and giveaway.The book gives an amazing insight in to the 'real food' through 'The Real Food Pyramid',importance of quality over quantity(Nutrient Density),how to learn the difference between the real stuff and imposters;the best foods that includes vegetables, fruits, nuts, beans, spices,herbs,organic meat & eggs;the worst foods including refined sugar,artificial sweeteners,hydrogenated oils, pasteurized diary,processed grains,conventional meat & eggs. 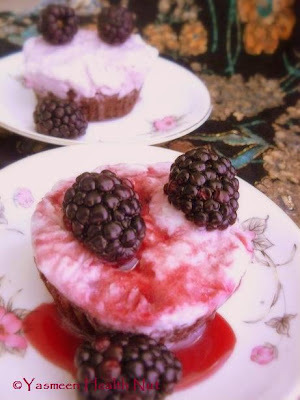 The book also highlights the best kind of sugar substitutes and also the healthy alternatives to hydrogenated oils and conventional dairy products. Some of which I have been prompting in my blog like stevia,maple syrup,raw honey,olive oil,coconut oil,Organic butter and coconut milk. We can best benefit from the real food choices by cooking them the right way.It is essential to follow some basic cooking rules like never over cooking them and using the right equipment,for example replacing the chemically coated non-stick teflon cookware with stainless steel,cast iron or ceramic cookware. The book introduced me to concept of Glycemic Load(GL) that is related but not same as the Glycemic Index(GI),which measures the carbohydrates content and the glycemic index of food to give an idea of the blood-sugar-raising potential of carbohydrates.Dr.Axe put together a neat comparison chart GI versus GL of commonly consumed foods ,choosing those with lower GI and also GL, like the whole grains, fruits and vegetables for better health. Using the food matching guide the recipes are marked as Quick recipes,Raw foods,Kids Favorites, etc. to best match the suiting category.Dr.Axe does not use conventional diary or gluten products or artificial anything in his short and simple healthful recipes.Take a peek here. 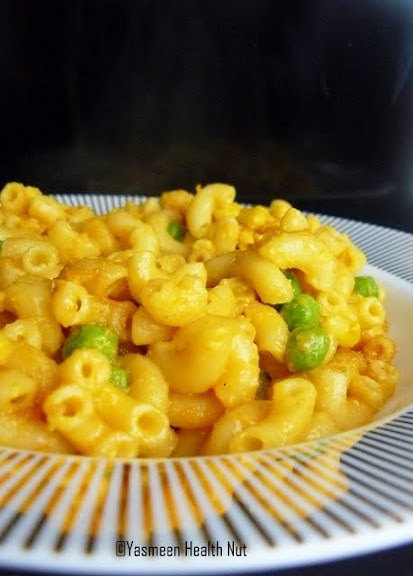 For my first trial I decided to go for a popular kids favorite - Mac & Not Cheese. Now,who could have thought of preparing this kiddie delight without the real cheese but a Health nut,Dr.Axe's replacement of Cashew butter for cheese and added flavors ,make this vegan sauce a definite go-go for those looking for vegan alternatives of diary products. To make the sauce blend all its ingredient as in the list until smooth,use a powerful blender like the Vitamix.Refrigerate in air tight container until its time to use it. 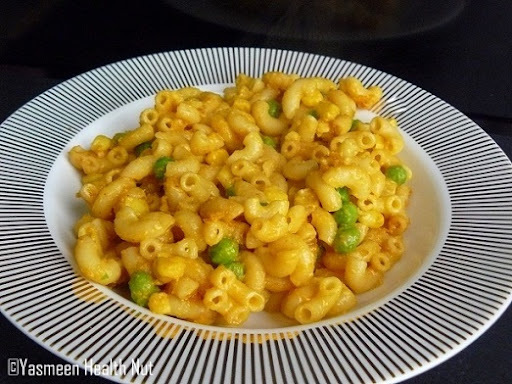 Bring a pot of water to a boil ,add salt as per taste.Then drop in the pasta and cook as per package instructions.Drain.Return pasta to the pot,add the peas and corn and cook another minute or two until vegetables are warmed up.Pour about a cup of the prepared sauce over the warm pasta,mix and serve. 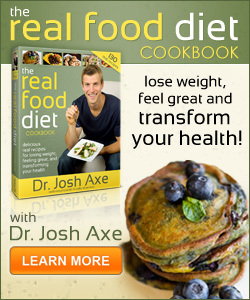 Dr.Josh Axe's 'The real food diet' cookbook Giveaway!! Here is your chance to get a free copy of this impressively Healthy cookbook. 4.If you have a Blog,please do mention about the giveaway in your current blog post. Happy 2011 y'all! The contest will run from Saturday, January 1st — Sunday, January 15th. I am already a follower :). I resolve to get outside and/or move my body everyday. I've been eating more vegetables and will be having fresh juiced veggies for breakfast from now on. I've been eating less carbs, more veggies, dairy products, meat and that works wonders. I just need more exercize now. I am already a follower and I plan to use more whole grains every single day for a healthy 'us'. I am a new follower. I want to exercise everyday, and continue to eat healthy. I too resolve to increase my vegetable eating habit from this year. Happy and prosperous new year wishes to u and ur family Yas..
Hi Yasmeen- been a follower for while now. I would like to include more salads and whole grains in my meals! I need a reliable source for recipes using whole foods and if I use yours I will link back to here with the credits, thanks. What can be more nice and healthy then getting the perfect result on health problems. I am your follower as bridgestranslation. I plan on implementing a vegetarian meal plan this year. I resolve to sneak more veggies in whenever I can, and keep up my workout schedule! Thank you so much for this wonderful post. keep writing post like this. 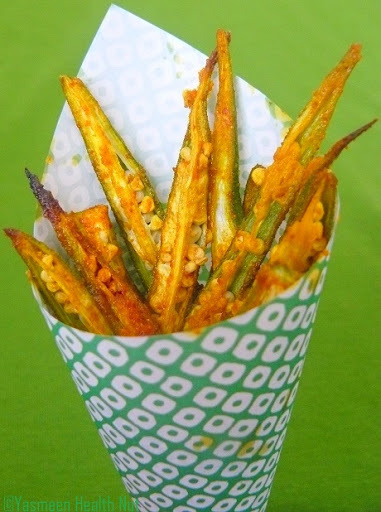 Hi Yasmeen, I got introduced to Healthy Yummy recipes from your blog! From the Buns and Soup to Salmon and pumpkin seeds, your creative ideas inspired me to cook healthy food.! Thanks a Lot.! Am in ur follower list. I ought to eat more home made food this year.luv the vegan mac n cheese. I'm doing the GAPS diet this year to get healthy. I have been seeing your blog for a while now. I signed up to follow just today. My resolution is to eat more whole grains, vegetables and fruits. And also to do Yoga regularly. My Son is allergic to gluten, this new book is very interesting to me for that reason as well. 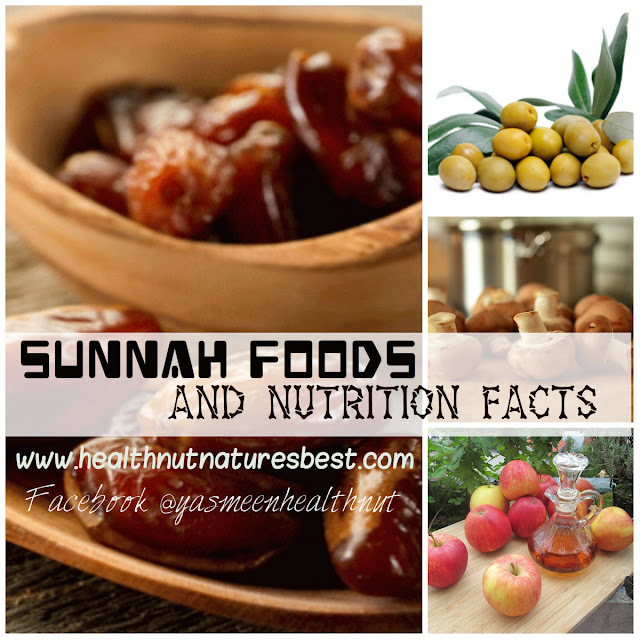 these can really helpful in your daily consumption of vitamins and put you healthy. Brainstorm is medical transcription provider company. this post was nice.And am very happy to hear about preparing healthy diet food.Please post more articles like this.